The following are a few Special Op projects that benefit both soldiers and their families, fulfilling many urgent requests and needs. 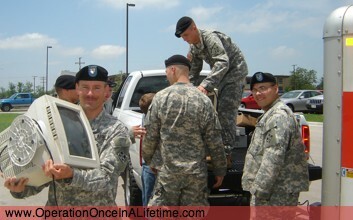 Operation Once in a Lifetime has delivered truck loads of furniture to many soldiers that are less fortunate. We have delivered beds to soldiers whose kids are sleeping on the floor, we have delivered donated couches to soldiers sitting on the floor at home, and we have also delivered over thirty computers to soldier who could not afford to purchase them on their own so they could email home. Now, to make it more convenient for kind members of the public to make donations, we have opened a resale center in Plano to collect and organize these contributions. If you have gently used furniture, clothes, toys or electronics please do not hesitate to drop them off at the resale center or to let us know if you would like us to pick it up. All contributions will be made to deserving soldiers. Many people in the United States are aware that soldiers do not make very much money, especially when considering the jobs they perform. A soldier takes two oaths when he/she joins the military, one is the oath that he/she will defend our country, even if it means our lives; the other oath is a silent oath, "I understand that I will not get rich being a soldier, I know that I may never have the car or house of my dreams while defending my country, and I realize that I will have less so that many can have more." A soldier's job is not an easy one but a soldier deserves to have the little things in life, if not just for what he does, at least to show him what he is defending and fighting for. With that in mind, we have created OPERATION MORAL SUPPORT: an operation where we try to provide a moral difference by allowing a soldier to experience something they would never otherwise be able to afford. A soldier will never be able to afford premium tickets to professional sporting event, nor a round at a PGA golf course and a soldier may never be able to take his/her family to a national theme park, but with this operation, they can. Operation Once in a Lifetime has taken hundreds of not just soldiers but their families to major sporting events around the United States. We have provided free tickets that where donated to us to give to these deserving service members. Soldiers have taken their kids and wives to these once in a lifetime events just days prior to being deployed to 15 month engagements. What a wonderful thing for a soldier's child to say "Before my daddy/mommy left I was able to go to a Dallas Mavericks game with him and it was awesome." 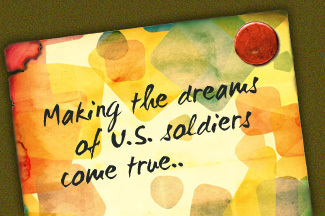 Let a soldier take that memory with him overseas -- donate unused tickets, hotel points, airline miles, or anything else that may treat one of our soldiers. This an operation in which we try to help a soldier's individual need. We realize that every soldier is different and every soldier may have a critical situation arise which may require some special attention. We realize that as much as we try to help a soldier we may not be able to do so without the kindness of others or other organizations. This operation allows us to post a soldier's story of not just him, but his family and the direct needs they may have. Operation Once in a Lifetime was morally created on the belief that we will never tell a soldier "NO". This operation allows us to fulfull that promise. We will focus on every soldier's need and share his/her story until their situation is resolved; we will also post updates on these soldiers and their families to show how Operation Once in a Lifetime, and those who have donated, have made a difference. Soldiers deploy all over the world -- Egypt, Germany, Korea and the Middle East -- but many of these soldiers do not get to come home. They do not get to come home because they can not afford to fly home. Soldiers deployed overseas are responsible to pay for their own flights home. If a soldier was stationed in Germany with his family and had not been home in two years, he would have to pay for him and his family to fly back to the United States. Such was the case for SFC Barta who was stationed in Germany for three years and had to spend almost $10,000.00 in tickets to fly him and his family home to Texas to visit his brother's son who is suffering from brain cancer. Many soldiers are not as fortunate as SFC Barta, because even though he was able to pay for it, he should not have to pay for it. He pays enough by risking his life for his country. Operation Once in a Lifetime has been able to fly several soldiers home over the past several months when the soldiers could not afford to fly home on their own. We would like to be able to fly every soldier home but we can not do it without donated airline miles and funding. 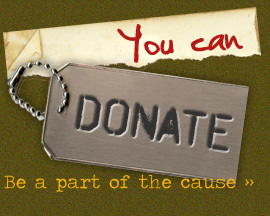 If you have extra airline miles, please contact us and donate them to a soldier. Help us fly every soldier home! Operation Once in a Lifetime needs your help to build our first of many non-profit daycares. Our goal is to build daycares in and around military installation which will allow soldiers to drop off their children so their spouses can work. The daycares will be free of charge for all military personnel and their family members, which will allow the spouse of a soldier to work and provide extra income for their family. Many spouses do not work when their children are little because the employment in and around military installation pay minimal wage or close to it. This means what income a spouse would bring in would all go to paying for daycare; this is why many spouses do not work. One of the main differences about our goal will be that military spouses themselves will be employed to work at the daycare, again to help provide financial stability for soldiers that are defending our country. Operation Once in a Lifetime would like to thank everyone who will and who has helped donate to make this happen. We will be adding updates to the website once we break ground and keep constant update on our mission OPERATION DAYCARE. Operation Once in a Lifetime receives numerous requests during the holidays from military service members who need assistance providing a good Christmas for their kids. These requests come from the families of those soldiers that are currently deployed overseas, stateside and even from families that have lost a parent protecting our country. Similar to "Toys for Tots" where Marines raise toys for lower income civilians' children, OOIAL works with local businesses to provide signage and gift wrapped boxes that help business collect toys for the children of U.S Service Members. We drop off those boxes and signs no later than the 15th of November. 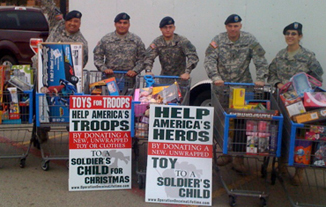 U.S. soldiers in uniform will collect the toys on the 16th of December. Many businesses and individuals choose to donate monetarily online or through our mailing address - in this case we use those funds to purchase new toys for the children of U.S. Soldiers. regarding our Toys for Troops program, please e-mail us. ©2008-2010 Operation Once in a Lifetime. All Rights Reserved. PO Box 797052, Dallas, Texas 75379. site design by durian papaya tree.